As I sit here and reflect on 2016, of course, I would want to vent on all the things that went wrong. Where would that get me? It would only drain my energy and mind on things I cannot change, leaving me miserable and agitated. I am choosing to be positive! 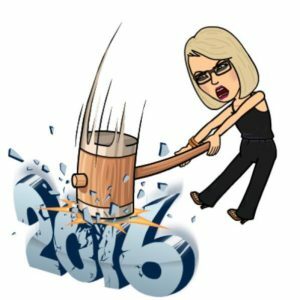 As I sat in bed on New Year’s Eve, I began to think about everything that happened in 2016. I decided to take ten positive things out of 2016 that can positively impact 2017. I advised this approach can help you too. First, each day we are given take a positive spin out of each day. Find even the littlest thing to go to bed with a smile. I saw on Facebook a brilliant idea. Each day write your positive thought on a sticky note, and put it in a jar. On New Year’s Eve, read all your positive vibes. Since I was admitted to the hospital on Christmas Day, I made a point to thank all the workers that gave up Christmas with their families to help others. It gave me the thought to encourage everyone to drop off a box of coffee and donuts to your local ER hospital care group on holidays to show appreciation for all they do. Just a special way to do something nice during the holiday season for others. Promote kindness. Everyday you are one step closer to your goal. Believe in yourself. As Craig and I learned so much about cancer in 2016, we decided to create a cancer foundation. We are excited to start, and give back too. We can’t wait to share details with everyone soon. Live in the moment. A lot of times we get caught up in all things that are ahead. Learn to appreciate the day and time you are living in, even when times are hard. Family First. When times throw you a curve ball, wrap yourself around the ones that love you. I am truly blessed my husband, boys, family, and friends were by my side through this cancer path. As much as it breaks my heart, that my health effected my husband’s playing time and Jake being pulled out of school and activities; remember we create normal. Sometimes in life, it is not what we want, but what we need. Experiences like this teach our children the definition of family values. Heartbreaks lead you to being a stronger person. We do not understand why things happen to us, but it could lead to an opportunity to make a difference or help someone else later in life. Social Media. As I watched so many people post fun times, remember behind all those pictures everyone can be struggling with something. This year when I look at pictures of my family and friends, I am making a point to call them more. By clicking like or writing a comment, does not allow you to really hear their voice and build on meaningful relationships. I allowed my husband to give me one positive to bring into 2017. Craig said, “When things go wrong, things can be fixed, even people. May 2017 be filled with much love, happiness, and abundance of health. God Bless You! Thanks for these! Positive vibes sent your way pretty lady. Very inspiring and encouraging words. May 2017 bring you and your family much love, great memories, and happiness! Love your spirit and attitude! You inspire others to be better! May you and your family be blessed in 2017 and beyond. Beautifully stated! I agree there are some things you cannot change but your attitude towards those things can make all the difference in the world. Wishing you and your family many blessings in 2017! All the best to you and your family, Nicholle. Stay positive. You got this! Thank you for sharing!! I pray 2017 is filled with family and friends and healing!! God Bless you and your family Nicholle! Your positivity is uplifting. You are helping me and others remember what is really important in life. Good can come out if a bad situation and I believe that you will be an even better person because of this. All the best to you and your family in 2017. You have a lot if people supporting you through this. Thank you Nicholle for sharing truly inspirational thoughts. May God bless you with good health! Wishing your family a joyous 2017. Beautiful, beautiful words we should all live by. Thoughts and prayers are sent your way. This IS going to be your year! Dearest Nicholle…I just read your blog about being positive. It was beautifully written, touched my heart and brought tears to my eyes. I always knew you were a special person but this takes my admiration of you to a new level. HE certainly has “given you a mountain”. This is a mountain you can and will climb and conquer! I think about you often..God bless you and your family. A positive attitude is half the battle, you’ve got this! And know that everybody here in Ottawa are behind you in your fight. Happy New YEar to you and your family. Very inspirational!! Thank you!! All the Best for 2017!! Praying for you Nicholle. 🙏 Thanks for being so transparent and uplifting. God bless you as you lean on him for strength and may He bless you as you travel this journey. Thinking of you, Craig and the boys so often…big hugs being sent your way! What a beautiful and inspirational focus on being positive! You are truly a special person & we love you! Very well written and extremely inspirational! All the best Nicholle to you and your amazing family! Just read you truly uplifting positive message on your blog Nichole. May God put his healing touch on you. All the best! Nicholle, I am praying for you through this. I only know cancer through watching a family member journey through it and I know that it completely changes your perspective on life. You’re positive outlook will get you through the hard days. You are a real positive inspiration to everyone! Good results. 2017 will be a good year. As I just finished my treatment for NPC cancer Sept 11. I am inspired by your attitude! You are a strong person. As I know how challenging this treatment really is!! Happy new year!! God Bless you and your family and Mr. Anderson is playing some good hockey! My mom had breast cancer in 2005 been cancer free 12 years and she will be 91 in August so keep fighten and I’ll keep praying for you and the team!